Planning ideologies are slowly changing. The recently released Metropolitan Planning Strategy, Plan Melbourne, advocates densified residential and commercial buildings at increased heights, particularly within the CBD and urban renewal areas – both of which are strategically located near jobs, transport and existing infrastructure. Despite these positive steps, the Minister for Planning, Matthew Guy, has been widely criticised for what many view as his tall tower ‘approvals binge’, leading to him being dubbed “Mr Skyscraper”. There are currently approximately 30,000 apartments within Melbourne City Council's boundaries, with over 100+ tall towers approved for construction in Central Melbourne. An estimated 15,000 more apartments housed within tall buildings are planned over the next five years. In August 2013, Professor Rob Adams, Melbourne City Council's Director of City Design, questioned this growing trend towards tall buildings and higher plot ratios and warned that the city centre could become '”Hong Kong but without the spectacular setting” if planning rules were left unchecked. Melburnians’ earnest engagement over the future of their city skyline exemplifies a community pride that has grown since the rejuvenation of the city centre in the 1980s, prior to which the Age newspaper’s architecture critic Norman Day described the bleak CBD in 1978 as “an empty, useless city centre”. Professor Adams’ comments thus embody a long-standing narrative of Melbourne’s developers and decision makers wrestling with community groups over the height of their projects. But are the claims that tall buildings are “soulless towers” destined to become “slums of the future” justified? What, if anything, is wrong with height and how do tall structures detract from Melbourne as the “world’s most liveable city”? Apart from densification enhancing Melbourne’s prime “liveability” status by containing urban sprawl, tall buildings can elevate cities by redefining their local and regional environment, creating jobs and opportunities, and becoming the iconic structures of re-imagined city centres. Melbourne’s flat topography allows appropriately positioned tall buildings to define and articulate the city structure, visually reinforcing areas of significance or noteworthy localities within the city area. The combination of appropriate site location and a considered architectural response enable tall buildings to become important city landmarks. Tall buildings should therefore be appropriately located if they are to enhance and complement the city structure and protect the amenity of sensitive areas. A poorly located, poorly designed tall structure can physically and visually overwhelm adjacent streets and neighbourhoods, overshadow nearby open space, create unnecessary traffic congestion, and produce uncomfortable wind conditions. Tall buildings thus have a responsibility to respect the surrounding environment. It is the opinion of this writer that Melbourne appropriately balances this obligation – take the Swanston Street city core as an example. The ‘heart’ of the CBD preserves its rich historic architecture and character by avoiding tall buildings and ensuring a thoughtfully blended contemporary design aesthetic. The majority of current tall building approvals are on the west and north-western edge of the Hoddle Grid, Southbank, or, more recently, Fishermans Bend. Urban renewal precincts such as Fishermans Bend are strategically located near jobs, transport and existing infrastructure. By creating efficient and sustainable tall buildings within and near the central city, the need for transportation and land are economised, resulting in increased social equity, shared resources, energy savings, and a reduction in greenhouse gas emissions per person. Unfortunately, these powerful ecological, social and economic arguments appear to have become too passé for those Melburnians agitating against the aesthetic of their evolving city skyline. Apart from the lifestyle benefits of proximity and connectivity to city amenity (not to mention the spectacular views), tall buildings are economically sound propositions. Taller buildings cost less per square metre to build. The rising land values in Melbourne’s central city have increased pressure to densify and achieve greater dividends for prime-location sites, which in turn allows high-risk investors the lure of recouping their outlays, thereby stimulating economic growth. The increasing focus on developer contributions in the form of public open space is also encouraging. Not only do these areas enhance the sustainability of the city by securing land for public use and enjoyment, they also enhance the streetscape by ensuring a pleasant public realm and community asset. It is here, at the street interface and lower levels of tall buildings, where attention should be focussed – and this is where the concern surrounding some tall building approvals is justified. The public domains of commercial buildings have generally been self-fulfilling because profits are maximised by creating generous retail space and public plazas that are as inviting as possible for business tenants. Residential buildings have caught up in recent years with an acknowledgement that the profit derived from the number of units needs to be balanced against an attractive public domain and activated retail frontage as investors have become increasingly ‘lifestyle’ savvy. Melbourne does have poor examples of taller development (mainly approved in the 20 years between 1980 and 2000) with podium levels facing away from the street employing high, blank, unactivated walls, which force socioeconomic activities inside rather than out. Such internalisation of uses results in the isolation of retail and social activities from the collective city community and the ‘buzz’ of city life. Simple landscaping elements such as tree canopies and streetscape designs incorporating awnings and retail frontages effectively mitigate internalisation of uses and solve the human-scale problem by creating a micro-environment for pedestrians. The combination of appropriate site location and a considered architectural response enable tall buildings to become important city landmarks. Tall buildings within and near the central city are sustainable – an argument that needs to be cogently reiterated. Appropriate street treatments can solve the human-scale problem by creating a micro-environment for pedestrians. The article was produced by Tim Retrot as Senior Consultant at Meinhardt & Jon Brock, National Director - Land Development at Meinhardt. The latest Meinhardt magazine Shaping is available and features further articles and discussion on tall building trends. Totally agree with the article. I've never understood why a building with fifty levels is any worse than one with thirty five. If height is seen as a negative then New York must be the epitome of poor design which of course it isn't. Bilby you don't work for The Age do you ? Your not one of Michael Buxton's students ? Ask any New Yorker and they would NEVER get rid off their famous skyline. Why did they choose to rebuild Freedom Tower ? NYC wouldn't be NYC without those as well as the liveable areas (which by the way I totally agree with you on). Melbourne's identity is it's skyline. Would you take down Eureka or Rialto, our two most photographed landmarks, given the chance ? Do people get excited when they land at Adelaide airport and see the lack of skyline ? Tall buildings inspire & attract people, a true measure of a cities prosperity as well as a forum for great architecture on a large scale. Our city continues to progress and we should aim higher where ironically the tall buildings are the only ones that the planning scheme literally demands be of high architectural merit. Central Equity et.al have been polluting our skyline with mid-rise garbage for years and I 100% agree with you we need more control over the design merit of these, but not at the expense of the tall ones or the low rise heritage buildings which give the city balance. If that's all we ever build we would end up looking like Vancouver, a city often compared to Melbourne for 'liveability' but has no identifiable image as it's skyline is a continuous mass of midrise with no character or balance. A lot of planning crimes have been committed in recent years on our city. The Citadines Hotel demolished a very unique middle-eastern style facade, Emporium destroyed Caledonian Lane and the Art Deco Lonsdale House etc. it's only been our high rise developments that have enhanced and promoted our city to the world in recent years. So let's move onwards and upwards ..
You are more correct than you know, Adrian. New York would not be New York and Hong Kong would not be Hong Kong, et al without those impressive skyscrapers - impressive being the operative word. You build me 4000 boxy, uninspiring megaliths that scream 'cheap' and I might agree with the detractors. But if you were to build 50 elegant landmarks that inspire a city's occupants as well as cashed-up overseas visitors who rave about how fabulous that city is, I don't really care how tall these structures are. Done properly - another keyword - the taller the better. So the oversight must come from the regulators, who in turn hold developers/builders to the highest standards. Otherwise, yes, we look like the twin sister of the less impressive aspects of places like Hong Kong. I have no connections with the Age and no, I am not a student of Michael Buxton. And I never argued that New Yorkers wish to "get rid of their famous skyline" - I merely stated a fact - that most New Yorkers would not choose to live in the really high-rise areas if given the choice between Midtown or Lower Manhattan and one of the lower-rise neighbourhoods either in Manhattan or Brooklyn. Having said that, most of New York is higher than most of Melbourne - i.e. around the 5-6 storey mark, with areas of higher buildings in between. New York's residential density comes almost entirely from buildings in this mid-rise height range, with only a small percentage coming from tall residential towers. So tall towers do little to prevent urban sprawl even when compared with walk ups - which is a moot point in Melbourne, since governments are intent on expanding the suburbs and urban growth boundary while building high in some areas of the city. In relation to the Rialto tower or Eureka, again I'm not sure what your argument is in relation to urban design. The fact that these buildings might be photographed as 'landmarks' says little about the effect they have on urban life. In New York, the most photographed landmark would have to be the Statue of Liberty, but no one would seriously proposed building more of them, or putting up other tall statues across the city for the sake of an eye catching skyline. Good buildings need to do so much more than look like nicely designed bedside lamps (as I believe architect David Chipperfield once said). Apart from a long distance photo opportunity, what is it that you think the Rialto tower itself (as opposed to the heritage buildings and lane ways next to it) or the Eureka Tower add to street life or the adjacent urban realm? Does it matter if said "elegant landmark" is full of poorly executed one bedroom apartments? 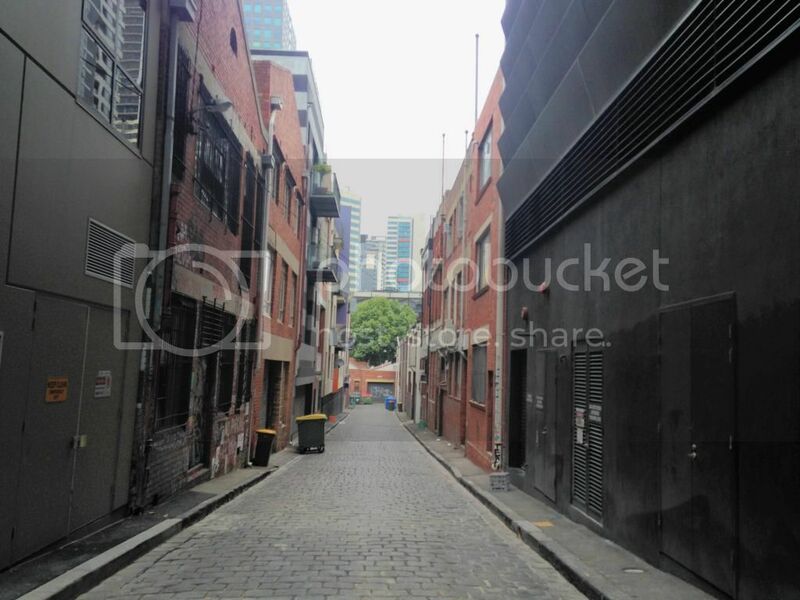 (See: https://urbanmelbourne.info/forum/cbd-54-64-abeckett-street-melbourne-81...) Or if it creates a barren and uninviting street environment? The irony of the situation with so-called 'landmark' towers, is that the land they 'mark' from a distance is often anything but 'landmark' in person. A tall tower might be exciting if it marked out a fascinating and liveable part of the city, showing the way to a memorable urban experience. Eureka sparkles at the right angle form Rathdowne Street in Carlton in the morning, but get up close and personal and it's a dog. Thought I would chime in. While I have nothing against the move to taller towers I feel there really isn't much in the way of thought going into the process. It seems for every MY80 we get a bunch of poorly designed towers that offer little in the way of good design (Central Equity I am looking at you) let alone decent street level activation. Areas that if developed right could be excellent retail opportunities are being demolished for ugly, sub-par towers. I think the recently approved Aurora is the epitome of this as well as the "taller is better because tall" way of thinking. My next huge gripe is the destruction of Heritage sites. Rather than Incorporate them cleverly into the design it's just the norm now to demolish them. Stand on A'beckett steet, you could literally be in any random area of Hong Kong. To reiterate, we need quality control in regards to what exactly gets built and to also make developers more aware of the rich, heritage sites of melbourne and maybe even make them work as part of their designs. Sorry for the hastily typed reply, I'm on my phone here. 3000 - you're going to explain a) what a random area of Hong Kong is and b) what is wrong with an area looking like such a random area? Seeing as you know Hong Kong so intimately, how could there be any commonality among my 'random areas' if one was say Causeway Bay, another was Tin Shui Wai, a third was a piece of the Country Parks that cover 50% of the territory, another was a little former fishing hamlet on an island like Cheung Chau, and another was a well built master planned development like Tsing Yi, or even a run down back street of Tsimshatsui. Which random area is it? If it bothers you all so much, then make CoM a compulsory 'co investor' in all new podiums. They can then design them to best principles, and leave the developer to do the floors above that. As for the size of apartments being offered, i don't see what business it is of anyone other than buyer and seller. They make them because people buy them. McMansions are a red herring in this particular thread and line of argument, Riccardo. But since you asked, no, I'm not a fan of them as an urban typology, let alone on the size and number of rooms issue. In terms of what should be 'compulsory' or not, I don't think state socialism is necessarily the answer here. I propose instead legislation that mandates minimum building, design and amenity standards. Radical, I know, but not as radical as your taxpayer funded investment model. No, my model is consistent with capitalism. If the state has some economic objective it wants to achieve, in this case, providing 'value' through podiums that the market did not see fit to, then it should use its own resources, rather than force private owners. Doing so would also place a realistic limit on the propensity of CoM to interfere. I think this may be a little impractical, Riccardo. In any case, let's return to the substance of the article - are high-rise towers more, less or about equally expensive to construct compared with mid-rise buildings? I'm saying that they are more expensive, and therefore not an efficient way of getting density in a city. Does anyone have any further credible stats on this? People closer to the truth will know, because they are not proposing buildings shorter than the allowable, and seeing as they are profit maximisers, it looks pretty plain that the path to maximum profit is tall, not medium or short. I believe there are certain height discontinuities, caused by construction challenges and lift capacity, but i am comfortable to let people with money at risk make these calls, rather than bureaucrats with no money of their own at stake. I'm not arguing that high-rise is not profitable compared with mid-rise development, Riccardo. What I am suggesting is that high-rise is more expensive to construct and run compared with mid-rise buildings - hence, the cost per m2 to buyers needs to be higher in order to make an equivalent profit. What this entails then, is that high-rise will deliver less density for $x than mid-rise when comparing residential neighbourhoods. There is also the environmental cost to consider, but let's stick to the economic argument for a moment. Does it matter if said "elegant landmark" is full of poorly executed one bedroom apartments? In properly functioning competitive markets, buyers will individually decide if space requirements are too big or too small. The onus is on the seller to provide what the market will bear. Having said that ..... if I put my conspiracy hat on, Agenda 21 fits in perfectly with what the 'elite' have in mind as regards living arrangements of future generations. Smaller is better (at least where the proletariat is concerned). Another long time first time here. Really good debate on this topic. I'd be curious as the extent of experience of those who promote high rise apartment living in actually spending any extended period of their lives living in such dwellings. How many of those who are changing 'planning ideologies' such as urban planners, real estate agents, architects, engineers etc and in particular the current Planning Minister currently do or would be be prepared to live the apartment lifestyle long term? Credibility comes best from direct experience in my book (and yes I have owned and lived in an apartment for >20 yrs). given the proliferation of towers and lax attitude to setbacks (esp. in fishermans bend), i think the "spectacular views" will increasingly be into other people's apartments. better quality is what the next planning minister needs to focus on. Bilby/3000 (if you are indeed different people) your argument appears to be that ALL Tall Towers = Bad Urban design .. a '.. barren and uninviting street environment' as you put it. This is such patent rubbish. Come down to Little Lonsdale St and see what the new Brady Towers have done to activate Sutherland St, which was a seedy carpark for many years prior. 380 Lonsdale St is set to open up Timothy Lane (currently a dead end) into another new vibrant laneway. Aurora Tower is set to do the same for the undiscovered laneways between La Trobe St & Little La Trobe, not to mention the currently feral junky ridden haven link to the train station below it. 3000 have you actually *SEEN* what they are planning to do with that site ???? The height of the buildings has NOTHING to do with bad urban design, these towers could be 100m or 400m towers and the new life & character they are bringing to our streets would be exactly the same. Eureka ? It has brought bars & street life to what was previously a carpark. Collins St Docklands ? Your apparent idea of midrise heaven is a soulless horrific ghetto of glass garbage that has destroyed the heritage goods shed and completely ruined an amazing opportunity to create a low-rise waterfront precinct, all in the name of a quick buck selling Collins St addresses off to developers. It's far far more the 'high rise urban hell' you describe than around any 200m+ tower our city has or is about to create. So once again, lay off the tall buildings mate. They are currently the only things saving our city. Go expend your energy against the true crimes being committed against our fine city. I certainly never said that all tall towers = bad urban design. It's just that most of the examples in Melbourne are shockers. I am assuming that you are joking about those sub-par Brady towers? Have a look at how they have treated the corner of Mclean Alley - dead concrete walls fronting the (soon to be) Guildford Lane heritage precinct, and canyon-like zero setbacks to the laneways and Little Lonsdale street, not to mention the carpark entrance on Sutherland Street. This is / was our most important remaining low-rise heritage lane way precinct and Brady are contributing to its degradation through, yes, the very poor urban design of their shoddy towers. As for Aurora, the lane ways behind are not 'undiscovered' - they were some of the best Melbourne had left before Ellenberg Fraser's building on A'Beckett Street gutted the landscape of Literature Lane, demolishing the heritage street wall of historic brick and replacing it with grills and unbelievably noisy cooling plant equipment. Little La Trobe has in turn been ruined with another sub-standard Brady tower which demolished yet another heritage building, now dominating the low-rise historic precinct - again with no setbacks and lots of lovely concrete precast panels. While we're at it, don't forget Brady's 'contribution' to the Vic Market precinct with its demolition of the incredibly lively and historic Stork Hotel. I also stand by what I said about Eureka, at its base it is dark, soulless, windy and lacks the human scale and character of our heritage lane way precincts. What percentage of its street frontage is concrete wall, plant / fire equipment cupboards and carpark entrance? I'd say at least 30%. And Collins Street Docklands is an unmitigated disaster - please don't associate my comments about mid-rise built form with the so-called 'designs' built there. They are shocking for the same reasons as discussed above. And lastly, no, I'm not the 'same person' as 3000. And what would you have built on those two car park blocks in Little Lonsdale St ? Never said the towers were pretty and yes the blanks walls aren't great but towers need some plant and services at ground level and you have to put the car park somewhere. I'm saying overall it's still a much better place to be with all the new shops than it was with empty car parks before. Carson and the tower next to it on the other hand I am furious about, taking away some of the brick frontage on Flanagan Ln and I'm very worried what Eporo will end up like, again taking away brick frontage and character of those streets. Also agree about that EF tower and that Brady Hotel on Little La Trobe they are shockers. But to knock Aurora because it's tall and before you even see the outcome of how it enhances the lane ways or otherwise is unfair. So yes there are lots of good and bad examples of street level fabric being enhanced or ruined around our city - but knocking 50m off the hieght of a tower isn't going to make any difference to that outcome. And if your against all high rise development because they require car park entries and ground level plant well mate move to Ballarat, it's the CBD you know ..
Melbourne is a high rise city but the CBD isn't the size of Manhattan to have separate high-rise commercial & low-rise residential zones - the closest we have to that is the Swanston St core which ironically is mostly commercial - so a balance has to be struck that keeps the ground level character intact while accommodating the needs of the tall .. Yes, obviously the scale would have to be reduced for that particular Little Lon. site. - I do like the articulation of Steven Holl's designs, though. In terms of the Manhattan comparison, it depends on what you mean by 'size'. Melbourne isn't constrained by an island, as Manhattan is, so had we planned well even 25-30 years ago, we could have maintained the CBD as a high density residential and mixed use commercial area while going high and dense in Docklands, for example (or choose your favourite near-CBD ex-industrial / port site). But yes, we have a different history to New York, and the city will obviously develop differently from that particular urban experiment. But even if you look at the situation now, we are seeing pressure to go high in near-CBD heritage neighbourhoods that may or may not be beneficial in the long term. As you say, if we can keep the heritage built fabric and do this, the result might be very liveable, but if not? What a wasted opportunity for a once unique Melbourne. Perhaps my A'beckett/HK comparison was a bit extreme. If it wasn't for the basketball court that street would be an actual wasteland though. No one can deny that. I still haven't seen a compelling reason to go so high so fast (but I'm not against tall). Its almost as though someone has had a coke fuelled thought of "we need to build as high as we can regardless of surrounding heritage sites and street activation right now!" Why couldn't Aurora be moved somewhere else? I understand the clever underground stuff going on with that particular site, but where they have chosen to build is smack bang in the middle of an important retail hub. Perhaps they could've proposed something more retail focused? It may sound like I'm anti-tall or even anti-development but I'm far from it. Lifeless alleyways and Southbank-style deserted street levels are not the way to go; especially so close to the Hoddle grid. Take Box Hill for example. I think the proposed Sovriegn Square is a fantastic example of what can be done in terms of residential and retail meeting together. They chose to build in a busy area and could've simply made the podium a bare stretch of nothing but didn't. I see what your saying now 3000 about the Aurora site being given away to residential while sitting on a major transport hub. I don't disagree with you, but the site isn't that big there would only be so much retail you could develop without resorting to a truly Asian style 'vertical shopping mall' ie. tall & skinny with congested retail spaces which I don't think Melbourne needs. At least they are doing some retail and making it a publicly accessible space around the train entrance, and it will be a damn site better than what is there now. In return Melbourne is gaining a stunning new landmark to be seen for miles around, the 'dancing lights' on the exterior of the building at night should look beautiful, much like the Aurora the building is named after .. Imagine if Central Equity had of got their hands on the site ? There are good and bad skyscraper developments just like these are good and bad residential developments of all types. I can point out many 3-8 story 'European style' developments in Melbourne which have been poorly designed and had a negative impact upon the streetscape. The scale and pace of the current apartment development boom caught all levels of government off guard and led to some mistakes. However the more recent approvals and refusals show that the government is coming to grips with this style of development and learning from these mistakes. Significant Applications now rarely include unactivated podiums, blank concrete walls or bedrooms with no windows. That is because applicants know that they are now unlikely to be approved. Melbourne is a young, enterprising city and it's character has been shaped by booms and busts, taking risks and making some mistakes. Each generation has left it's mark on the city and has been able to keep some of the best of what the previous generation had to offer while being able to put their own mark on the city. Melbourne has been at it's best when it has been developing and evolving rather than the periods of conservative stagnation. (this gets a bit rambly so sorry about that but the first sentence is the question that I ramble on about through this comment). While I tend to agree with much of what you are saying Bilby the real question I have for yourself and the likes of Buxton is where is all this mid rise going to go? I'm not a fan of a 'big Australia' but equally I'm not going to close the borders or put in a one child policy so we need to accept that Melbourne as a city will grow to 5-6-8 million people over time. buxton likes to say 'there are ample brownfield sites to accomodate growth'... so yes we do Fisherman's Bend without the towers, Victoria Gardens precinct, Collingwood, Brunswick etc. But you still end up with may 10% of 'inner' melbourne as this mid rise European/East Village utopia and the majority locked away as 1/2 storey cottage housing and heritage shopping strips. It seems that most people who have an interest in urbanism do not like Sprawl. In the Melbourne context of retrofitting density to our existing City and given the above comment on the availability of brownfields development I do not see how accomodate the projected population growth into the existing city footprint without high rise in designated areas. To me those areas are Southbank, Docklands, Fish Bend, EGate, CBD probably filtering down to 20ish stores in the industrial parts of places like North/West Melbourne, Arden, Footscray (Josephs Road), South Yarra (Forest Hill), St Kilda Road, South Carlton, Box Hill, Dandenong, parts of Collingwood and East Melbourne, Moonee Ponds, Richmond Station, Port Melbourne where the areas for development are smaller than that contiguous CBD area and so some tapering of height is justified to the adjoining residential precincts. From those 20ish stories I don't have a great issue with medium density along the shopping strips/tram lines and generally spread through the suburbs to train stations and brownfield sites (like the proposed redevelopment at Kodak in Coburg North). To be clear I'm not suggesting that facading every heritage shopfront on Brunswick Street is a good outocme but there were enough demolished in the second half of the 20th century to creat ample development sites for 5-8 stories in most shopping strips. There are also enough large sites that can accomodate new built form while maintaining the integrity of an existing warehouse etc. And a couple of general comments on development to show my personal views and how they influence the above. 1. I think more needs to be done to protect genuine heritage. As Nicholas pointed out above I think saying the historic Koorie Court and Andrews Buildings stretches the credibility and resources of heritage protection. So any development in any place I mention below shouldn't be immune to heritage protection. 2. that height has absolutely zero to do with street level activation. I agree Eureka at street level (and first 10 levels generally) is a giant turd. but if Eureka was 100m not 297m it wouldn't be any better... One of the big issues for street activation of towers is our design requirements for access to services, emergency exits etc. so many 'stuff' is required to be externally accessible that it is hard to hide. BTW. Height does influence urban design with respect to wind and shadowing. I don't really have any issue with height 'looming over' a heritage low rise building especially in the CBD - yes Parliament or the Shrine should have some view and physical dominance protected but who cares if a heritage corner 2 storey pub is surrounded by towers - it hasn't harmed the Mitre Tavern. The Koorie Heritage Trust (not the Koorie Court) has a fantastic original warehouse interior with raw trusses and solid hardwood timber posts. It's a great example of a perfect adaptive reuse scenario. Heritage isn't just about grand frontages - too many people see it in terms of decoration for our cities - our heritage is so much more than that. If we lose all the interesting interiors and spaces inside these old buildings, we lose much of what is interesting about them as heritage places. I specifically moved to the city after growing up in the suburbs to avoid aluminium shop fronts, dodgy mall spaces and reproduction interiors. The city was raw, real and historic then. We can incorporate the old with the new - hence the building mentioned are exactly the sort of places we should be keeping now while all this development is taking place Lose them, and the city becomes just another dense, high-rise Doncaster. Of course if something is a bit long in the tooth and offers no real value then get rid of it. But suburbs like Brunswick are famous for their gritty, urban feel and as I have stated I would hate to see it demolished and replaced by poor design. I also love the idea of repurposing buildings (providing they are safe) and even adding old to the new. The forum turned out to be an alright example of this. Could've been a lot worse. still didn't answer the base question where is all the low-mid rise high density going if the vast majority of the (inner) suburbs are locked up as 'heritage cottages' or 'heritage shopping strips'? The area of heritage housing and shopping strips is small compared with the potential number of apartments that could be constructed on non-heritage sensitive infill sites, brownfield sites and ex-industrial land. With careful land use assessment and proactive zoning, we can accommodate all the required dwellings with minimal impact on heritage sites. We could also get a bit more creative with our land use - for example, have a look at the land to the south of the train line along Wellington Parade East Melbourne, from the corner of Flinders Street all the way down. Yes, it is 'parkland', but is little used, being noisy and right next to the train line. With clever planning, we could build high along the rail line, with buildings fronting Wellington Parade behind the existing line of trees near the footpath, accommodating literally thousands of apartments in a great location close to the CBD. The value obtained from the land could in turn be used to create parkland where it is more useable and needed in dense areas in the inner city. Perhaps more realistically, areas like the Gipps Street precinct in Collingwood could also sustain more intensive development on many ex-industrial sites. Although we need to be careful, as these areas provide much of the employment in the inner-city. And its worth considering whether all development needs to be so close to the CBD - building along the train lines out a few ams towards the suburbs would go a long way to solving the housing issue, as well. Bilby - Just on this I had a chance to walk down Literature Lane today (yes I can't believe in 12 years of living in city up the road I never had before). I think it's a stretch to say both it and Little LaTrobe have been 'gutted' and 'ruined' - there is still a majority of the heritage buildings in both streets before we go that far, but I do of course agree 100% that replacing those buildings with blank walls and noisy plant is an absolute disgrace. Ironically though, in the case of Lit Lane that EF development has created the one and only bit of street activation in the Bao cafe right up the top in the corner (behind my right shoulder in the pic) and you can walk through to A'Beckett St which is cool, which is pretty much the only reason for visiting this street as the rest of the laneway doesn't really lend itself to much other activation or even some street art as it's pretty much all rear end carparks and windows of offices or housing anyway, so have we lost that much ? The art supply store in the beautiful old Edwardian factory there used to run through to Literature Lane, so it was an 'active' frontage of sorts. And yes, we have all absolutely lost out here - these remnant old industrial buildings have character and while not all 'active' now, could easily have become cafes and bars on Literature Lane and Little La Trobe Streets in due course, as we are now seeing happen in Guildford Lane (also completely unprotected with no heritage listings). Had we kept the low-rise A'Beckett and Literature Lane precinct, neighbourhoods like 'Aurora' would have had these magnificent little lane way precincts literally as their backyard - stepping down them was almost like finding a little piece of 19th century just metres from the main road. Now they are progressively being turned into concrete canyons. And that little EF cafe you mention? It's alright, but has no historic character whatsoever. Aluminium shopfronts ... meh. And fronting onto a lane way next to a noisy plant housing and associated grilles ... no thanks. And if you don't think Literature Lane isn't already ruined, give it another 12 months or so, then get back to me. Unless we actually can achieve some heritage protection for these old landscapes, they will all go the way of Literature Lane in the years to come. They both look crappy to me. One looks like the typical tower induced canyon laneway and the other is just seedy. Was there any activation in the old set? It needs some life either way. I think you missed my point, 3000. No, there was no "activation" back in 2007 when I took these shots - but if you knock down the heritage buildings, you exactly "activate" them down the track, can you? Look at the doors and openings in the old industrial buildings, and imagine some character-filled lane way bars, cafes and shops. This could have been a very charming little streetscape indeed before the EF and Brady wiped out a good section of the street wall with their unpleasant blank walls and noisy overhead services grilles. Good luck "activating" this lane way now. I'm denying it looks flat out awful right now. Like I said, typical lifeless laneway. It's hardly "typical" - Literature Lane has one of the most intact original 19th century bluestone surfaces of any of the remaining CBD lane ways. Not relaid, reset or redone with newer stone - it's the real deal.